“In computer science, reflection is the process by which a computer program can observe (do type introspection) and modify its own structure and behavior at runtime.” says Wikipedia. An important conecpt of vCO is to create a so called Workflow Token for every single time a workflow gets executed. Only so it’s possible to keep track of multiple in-parallel runs of the same workflow, what’s absolutely possible. (Currently supported in vCO 4.2: 150 concurrent running workflows). If you are familiar with object-oriented programming, consider the Workflow as a class (description), the WorkflowToken is an actual instance of this class. <Additional Technical Background>: All information about the state of a workflow token is stored in vCO’s database (the state, the attributes, the current element,…). So it’s possible for vCO to continue the workflow even after a crash of the server (Checkpointing). The following script examples shows all that stuff: First we get some information about the current instance (you got it, the WorkflowToken). Starting in line 10 we access the Workflow, the last part from line 23 uses the WorkflowToken again. //get the current workflow token /"instance"
All that happens just in the script, there are no workflow attributes bound to this scriptable element. The Workflow you can download below has one INPUT Parameter, just to see something in the logs :-). It’s not used anywhere. Now, what to use all that stuff for? If you are working with the Business State field of workflow elements, you eventually want to read this in script. 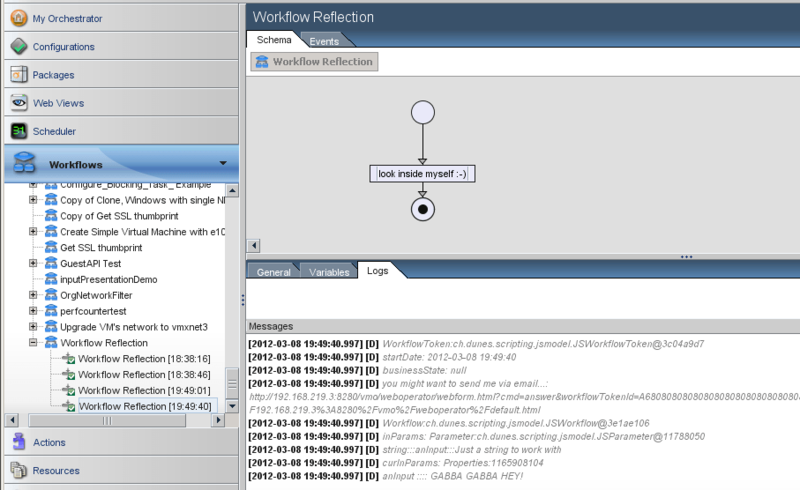 The same objects are used when you access past workflow tokens not of the current workflow, but of other workflows. This can be used for instance to create Healthcheck Workflows which monitor the vCO Server for failed or canceled workflow runs (a much cleaner & more reliable ( & supported) way to replace the SQL-cram mentioned above!). Excellent post, I have just been working through all of this unfortunately this was a little late for me to find however it reinforces all my findings. The business state field led me here! This post is like gold in my opinion. Well done. Is it possible to change the workflowTaskItem order of a running workflow? Reason I ask is I’m looking at some custom error handling and would like to skip elements that are unnecessary to re-run and just go to the appropriate nextItem. Not a valid package file, dunes-meta-inf is missing !